-- Select a Size/Color -- Medium Large - Out of Stock! Add some sweetness to your spring day with the Doxie Love Dog Collar! 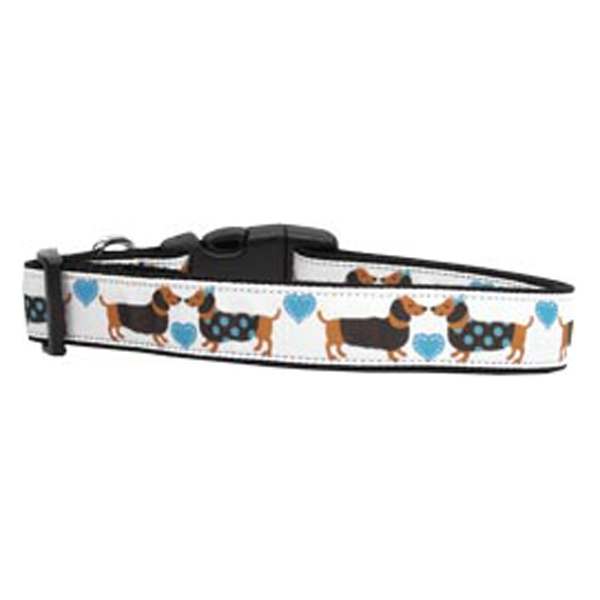 Love will fill the air with the Doxie Love Dog Collar! This fashionable, durable Ribbon on 1" Nylon Webbing Collars from Mirage Pet Products are sure to make your pooch the talk of the neighborhood! Made of durable nylon with a high quality ribbon overlay. Collars have high-quality adjustable quick-release buckles to fit a variety of neck sizes. Made in the U.S.A. Matching Leash sold separately. Doxie Love Dog Collar Customer Photos - Send us your photo! Lady loves her new Doxie Love collar (and matching leash)! We even ordered an extra one to donate to our local dachshund rescue, for one of their fundraising auctions! Jessie was adopted 2 years ago at 4 months old from a local shelter. She has been the sweetest girl and fit right in with a houseful of dachshunds. Posted On 08/16/16 by Michelle K from Athens, AL Yes, Michelle K recommends this product! This collar says it all! Who could pass up this precious collar! Looks stunning on our Doxies! They get many compliments when wearing! Fits perfect, washes well! Posted On 07/14/16 by Virginia B from Grandville, MI Yes, Virginia B recommends this product! I love this collar, I bought an extra one to donate to our local dachshund rescue. Looks super cute on my dog, and has a matching leash. Nice quality and I like the wider band on my dachshund. Only complaint is it really should come in one size SMALLER than this for mini dachshunds! My girl is in the 'medium' range as far as dachshunds are concerned and it was barely small enough for her! Posted On 01/28/16 by Diane H from wilton, IA Yes, Diane H recommends this product! Posted On 06/22/15 by Virginia B from Grandville, MI Yes, Virginia B recommends this product! This collar is so cute! I donated it to my local dachshund rescue! Posted On 04/07/15 by Virginia B from Grandville, MI Yes, Virginia B recommends this product! This collar is adorable, I love the pattern! Quality looks great too. This dress is beautiful, girly, flurty and exquisitely full of details from the diamond like buttons to the eyelet collar & as usual the great quality & customer service I have learned to expect from Baxter Boo. It is more beautiful in person because the fabrics used are lovely. My fur baby looks beautiful in it. Thanks again Baxter Boo!! !